You know a pizza place is good when David Chang and his camera crew decide to feature it in an upcoming episode of Lucky Peach. 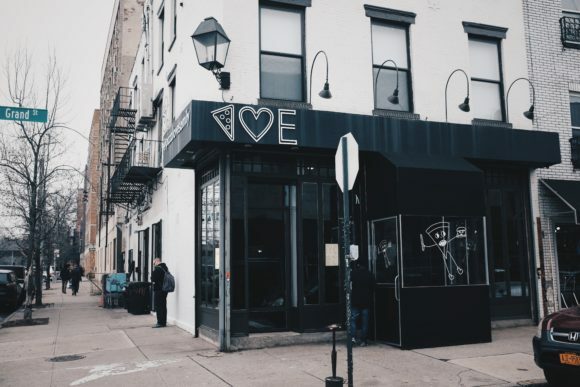 That’s what we stumbled upon when we stopped by Emmy Squared, the new pizza restaurant in Williamsburg run by Emily and Matt Hyland, the duo behind the very popular Pizza Loves Emily in Clinton Hill, for brunch. There were cameras in the back filming Chang and someone else digging into a plate of what looked like a very delicious and immense spicy chicken sandwich. With the Chang stamp of approval, expectations were sky high. Emmy Squared did not disappoint. 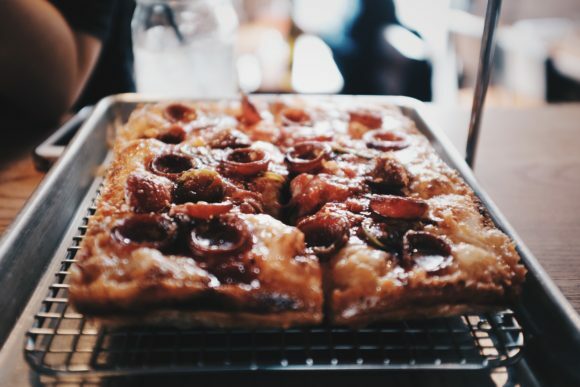 Detroit-style pizza, which is the restaurant’s specialty, is an unheralded style that may now be having its breakout moment. 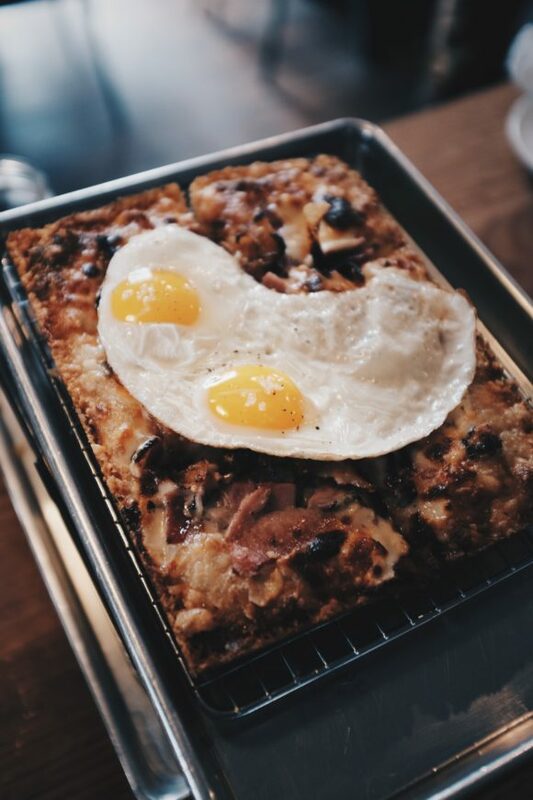 So what exactly is Detroit style pizza? The most obvious difference is the crust. It’s a thick crust, somewhere in between a thin New York style crust and the overbearing deep-dish Chicago one. As a result, it’s not a doughy, bubbly crust with lots of air pockets, it is dense, and the most helpful frame of reference is a Pizza Hut crust. If you can recall the crust of your suburban childhood, you might remember how it was crispy and golden due to the generous layer of oil that was probably sprayed on it. It was probably the best thing about a Pizza Hut pie, which explains all the renditions of “stuffed-crust” this and that that followed. So imagine a Pizza Hut pie with much better ingredients and an even better crust. That’s an Emmy Squared pie. We tried one red pie, the Colony², and a white pie, the Eggy Blonde, which was perfect for our group of 5. Each pie was split into 6 squares, which meant everyone could have one of each. The Colony² by far was the superior pie, with each bite bringing me sheer joy and knocking out any pizza I had rated as the best ever out of contention, including potentially the Bee Sting pie from Roberta’s. The combination of savory pepperoni slices and a little drizzle of sweet honey is a winning one, and that fantastic golden Detroit style crust is like icing on cake. The Eggy Blonde was solid but didn’t have the same chemistry. Next time I’ll take my sunny side up eggs with a side of toast. 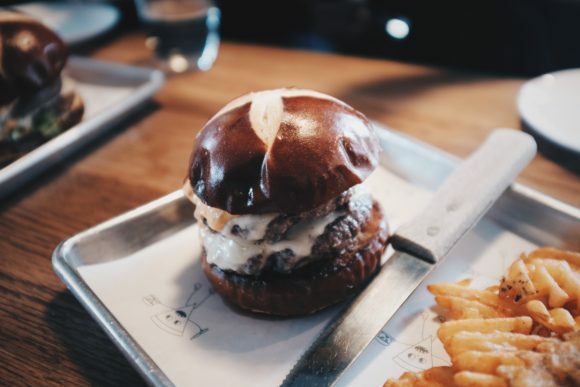 Emmy Squared also specializes in sandwiches, and one I would recommend is the Le Big Matt burger, a beast that consists of two double-stacked pasture-raised beef patties, American cheese, pickles, some greens and a Thousand Island-esque Sammy Sauce, served in a pretzel bun. It doesn’t have quite the same magic as the Emmy Burger from the flagship restaurant, which in my opinion is the best burger in the city, but there’s no denying how impressive it is. It’s also served with crispy, seasoned waffle fries, also an underrated form of fries that gets its due here. If you’ve gleaned anything from this article, it’s that Emmy Squared’s style is big and over-the-top, although it’s able to back up all that flash with some culinary bravura. The same applies to the dessert we tried, the rice krispies ice cream sandwich. 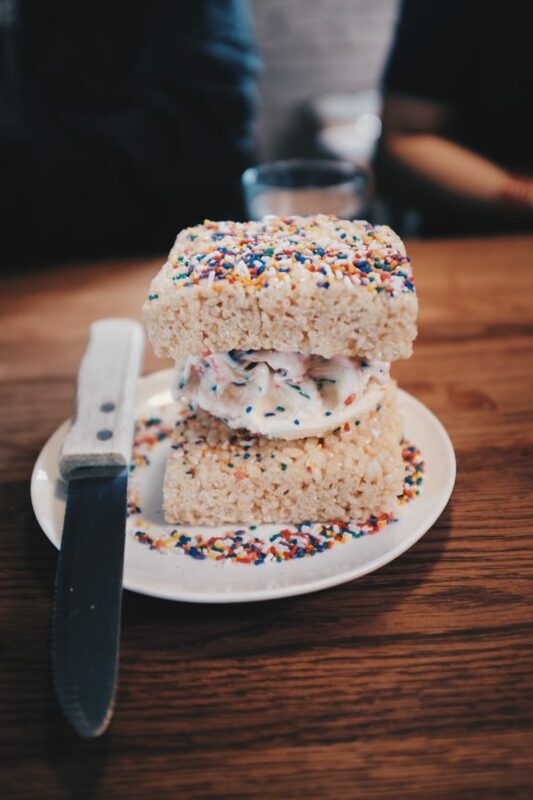 Try cramming two super-sized rice krispies treat squares and a large scoop of confetti-filled ice cream from Oddfellows into your mouth. Not possible. There’s only so much you can fit into your stomach. If there’s not enough room for the dessert, that’s okay, as long as the pizza makes it in.